The Agribusiness Council (ABC) is a private, nonprofit/tax-exempt, membership organization dedicated to strengthening U.S. agro-industrial competitiveness through programs which highlight international trade and development potentials as well as broad issues which encompass several individual agribusiness sectors and require a "food systems" approach. Examples of such issues are commercialization of new technology/crops, environmental impacts, human resource development, trade and investment policy, natural resource management, and rural development. U.S. agriculture is represented by state and local agribusiness associations, national farmer and cooperative organizations, and trade/commodity groups, but The Agribusiness Council is the only national private sector group positioned to embrace U.S. agriculture and its allied industries -- whether in sponsoring trade missions, or representing concerns to government. As an agribusiness association, The Agribusiness Council provides access to a communications network encompassing small and medium-sized agribusiness companies, university/research institutions, other nonprofit organizations, as well as public sector agencies. It represents a unique neutral "umbrella" under which the entire range of U.S. agro-industry players can come together for constructive, informal dialogue and action within the vast arena of intricate agricultural business, education and policy issues. 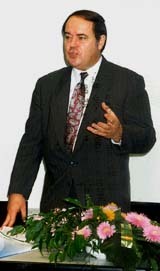 As an organization with international linkages, The Agribusiness Council seeks to strengthen the U.S. agricultural sector's international outreach through stimulating private enterprise trade and investment solutions in Third World agro-industrial development - and fostering heightened public awareness of agriculture's vital importance in national and global economic health. 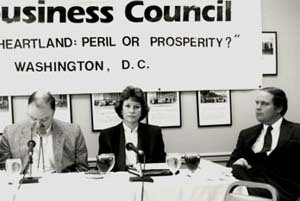 Initiated under Federal government auspices by President Lyndon B. Johnson in 1967, The Agribusiness Council was formed by a group of business, academic, foundation and government leaders in order to facilitate American agribusiness participation in agricultural trade and development programs with developing countries - and represent private-sector agriculture interests to Federal government decision-makers. NAFTA DEBATE -- Both "pro" and "con" viewpoints were heard at ABC's conference in Washington, co-sponsored with the American Foreign Service Association. Coordination of international agribusiness management education/training. Recent activities of The Agribusiness Council have targeted Eastern Europe, The Baltic States, the Caribbean, Indonesia, India, Sri Lanka, the Philippines, East Africa, Egypt and the Middle East. Many other countries have registered their desire to establish more relationships with companies and other elements of the U.S. agricultural complex - and the Council activities will be expanded accordingly. ETHANOL SCAM-- Nicholas Hollis was recently interviewed on Fox News Channel's Weekend Live about the health risks of ethanol smog. For additional resources on this subject: Agribusiness and Bioenergy: A Case of Dysfunctional Partnerships and Anti-Competitive Behavior. In order to enhance Council responsiveness to local/regional U.S. agro-industry (especially small and medium-sized agribusiness, and farmers) and to effectively facilitate the transfer of information from the national and international levels, the Council is informally linked to a growing number of state/regional agribusiness council groups around the country. Commonalities and complementarities between emerging country and state/regional expertise and capabilities can also be more readily identified (see State ABC Links). The Agribusiness Council (ABC) is guided by a board of directors, a Washington advisory committee, and a small Washington-based staff headed by president and chief executive officer, Nicholas E. Hollis. Financial support is derived primarily from the membership, subscription and program fees of private companies, foundations, universities, and individuals committed to the international expansion of U.S. agricultural markets and more effective policy coordination. POLISH AGRIBUSINESS ASSOCIATION -- Nick Hollis speaks before a Polish farmer group at Minikowo, one of fifteen workshops which led to the creation of the Polish counterpart association. 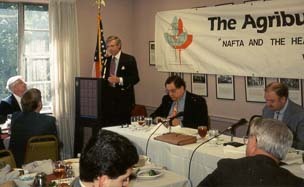 To strengthen its international outreach, The Agribusiness Council in 1987 partnered with the Agri-Energy Roundtable - a multilateral organization accredited by the United Nations to strengthen the cooperative ties between Third World and industrialized nations in the areas of agriculture and energy-related trade and development programs. Through the Roundtable's worldwide "association" network, regional programming, and annual meeting - The International Agricultural Forum, members are able to exchange ideas with a wide array of corporate executives, government and international donor agency officials, as well as access the Roundtable's international membership body. As the world's largest and most efficient supplier of agro-food products, the United States faces fierce competition from an ever-increasing number of world "breadbaskets." Maintaining U.S. agribusiness global leadership requires a forum capable of embracing our nation's agricultural constituents; and a mechanism for action on broad, complex issues requiring multi-sectoral coordination and representation at the highest national and international levels. If you have an interest in strengthening U.S. agro-industrial competitiveness, while enhancing your own business outreach and contact base, and are involved in any segment of our nation's vast agro-industrial complex, then you are eligible for Council membership. By joining The Agribusiness Council, you can have an immediate impact on its program and policy direction. Interested members are encouraged to sere on one of the Council's committees or task forces, and/or to nominate a representative to the Board. 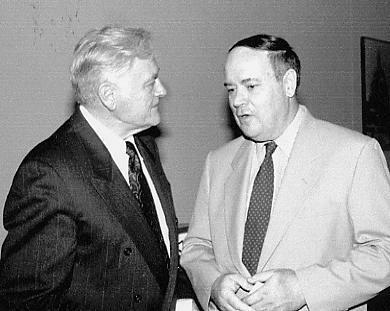 LITHUANIA -- President Adamkus discusses Baltic affairs and related agro-environmental concerns with Nick Hollis during Washington visit in early September. ABC is providing technical assistance for the establishment of a Lithuanian counterpart association as part of a bilateral protocal signed in May 2000. DISCLAIMER: The Agribusiness Council (ABC) website is provided as a service to members, supporters, subscribers, and interested visitors. The Council recognizes the value and potential of publishing and sharing information on the Internet. However, the presence of a page or link is not an ABC endorsement of its content, accuracy, timeliness, or value. The views and opinions expressed in the pages and links are strictly those of the page authors, and The Council accepts no responsibility for such contents. Information on programs and association schedules may change without notice. The Council reserves the right to modify the texts of these programs and schedules. Comments on the contents of these pages should be directed to page authors, or their respective association addresses. ©2000-2014, The Agribusiness Council, Inc.